The Barn has been beautifully restored and is set in a quiet farmyard with easy access off the A388 Saltash to Callington road. It is just metres from Dupath Well (right), the largest Holy Well of its type in Cornwall. There are plenty of parking spaces adjacent to the building with a short gently sloping path to the main entrance. The Barn is centrally heated and offers views toward Kit Hill. The toilets are on the lower floor with disabled access to these via the exterior of the building. Our guests are impressed with the atmosphere in this room with its original stone walls, high beamed ceiling and restored roof, which give a wonderful setting for any celebration. With a maximum seating capacity for 40 people, this facility is ideal for a small to medium size function, tailored to your needs. We use produce from our own farm and source other items locally wherever possible, which are then cooked and presented to the highest standard. 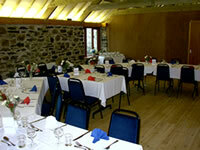 Special diets can be catered for if we informed at the time of booking. A sample menu follows, but we will try to cater for any requests. We have no liquor licence, but are happy for you to bring your own wine with you. We can supply a range of soft drinks if required. 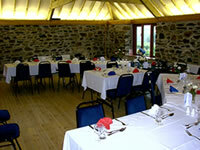 The Barn provides an ideal conference centre in the quiet of the countryside. The room is adaptable and there is an OHP and screen available for hire. 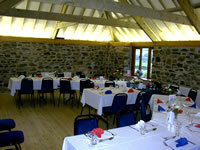 Meals and light refreshments can be provided as required as well as tea and coffee, prices available on request. Cost of hire of room: £9.00 per hour. LCD screen and mm projector available.